Aon, the risk management services provider, has leased almost 11,000 sq mat Enterprise Park in Cracow. The agreement concerns the office space in building E, which is currently under construction, and includes an expansion option for another 6,000 sq m. It was made for 10 years. The tenant was represented by CBREin the lease negotiations process. Aon plc (NYSE:AON) is the leading global provider of risk management, insuranceand reinsurance brokerage, and human resources solutions and outsourcing services. Through its more than 72,000 colleagues worldwide, Aon unites to empower resultsfor clients in over 120 countries via innovative and effective risk and people solutions and through industry-leading global resources and technical expertise. We have chosen Enterprise Park owing to its convenient location and flexible office space. After moving to the complex, we will be able to consolidate our Cracow offices, improve cooperation and human capital management. Moving to the new location will also allow for further expansion and business development. Cracow remains the most attractive city in Poland for BPO/SSC companies. Over 180,000 sq m of leased space in 2015 and 200,000 sq m under construction prove a rising interest in the city. It is not only the availability of highly qualified employees, but also the overall business climate that attracts new brands to Cracow and gives a reason for the existing ones to stay and expand. The Enterprise Park complex is located in the south of Cracow, which guarantees hastle-free commute by car and public transportation, as well as the vicinity of the airport and large housing estates. The project currently comprises four A class office buildings with a 100% occupancy rate, and a total area of almost 36,000 sq m. Two subsequent buildings:E (15,600 sq m) and F (10,900 sq m) are under construction, and are scheduledto be completed in 2017. 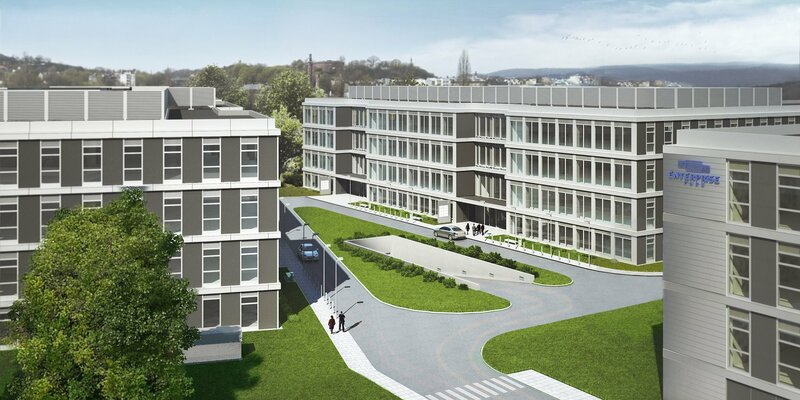 Enterprise Park is one of the best locations in Cracow for rapidly growing businesses. Owing to the high standard of the space available for lease, state-of-the-art technical solutions anda proactive approach towards managing the office complex, we enjoy unceasing trust of both current and new tenants.